The UK government has said it is talking to French authorities to ensure there will be "no repeat" of clashes between fishermen over scallops off France's north coast. On Monday, nearly 40 French boats confronted British rivals they say are depleting scallop stocks in the area. The UK's environment secretary says the British boats were fishing legally. France says it is ready to send more police vessels to the area to prevent further clashes. Boats collided and stones were thrown during the confrontation off the coast of Normandy in the early hours of Tuesday. Local official Ingrid Parrot said the situation had been "extremely tense" and both sides had thrown objects at each other. She defended sending just one boat to police the incident overnight, saying: "The aim was to stop the tensions from increasing. We sent only one ship that day, but we will send more if it's necessary." Could Brexit calm troubled waters? 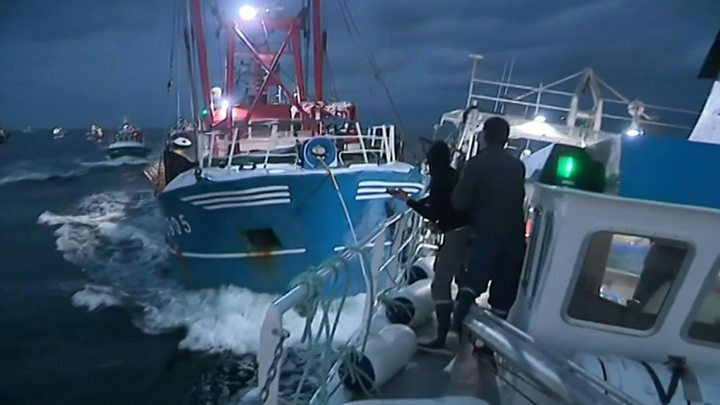 Mike Park, chief executive of the Scottish White Fish Producers Association, said the incident was "high seas piracy" but said the French had agreed to a request for talks. "We need to decrease tensions in the whole area," he told the BBC's Victoria Derbyshire programme. The European Commission urged France and Britain to find an "amicable" solution. The French boats gathered overnight on Monday in protest against so-called "pillaging" by five larger British vessels. The British were chased away with two boats, Golden Promise and Joanna C, returning to Brixham harbour with damaged windows. The crews alleged they had been surrounded and had rocks and metal shackles thrown at them, but French police said UK boats responded in kind. Tension has rumbled for 15 years, but in the past five a deal has prevailed - larger British boats stayed out of the area in exchange for more fishing rights. Marc Delahaye from the Normandy fishing committee said they also objected to the British using "great dredgers" in the area, while the French used smaller boats. The UK scallop industry is worth £120m and supports 1,350 jobs. About 60% of the catch is exported - with much of it being bought by the French. But a 2016 report by the International Council for the Exploration of the Sea (ICES) warned that the fishing effort by France, the UK, Belgium and Ireland in the Bay of Seine was "too high". International environmental group ClientEarth said it was "disappointing" to see boats catching scallops during the spawning season, when it said depleted stocks could reproduce and grow. France was demonstrating "high environmental standards" by banning its fleet from fishing during the summer, the group said. Inevitably Brexit looms large. Some French fishermen hope that when the UK leaves the Common Fisheries Policy, British trawlers will not be allowed into these waters. But it may not be as simple as that. It is still not clear what agreement an independent UK may make with the EU on fishing quotas. And the French desire to negotiate some continuing access to British waters may be more important than protecting their scallops off Normandy. So Brexit may change the rules of the game but it is unlikely to bring an end disputes to like this. How have the British responded? Environment Secretary Michael Gove said the government was talking to French authorities to ensure there was "no repeat" of the clashes. He told the BBC his heart went out to the British fishermen involved, who had "absolutely every right to be fishing in those waters". The French had a "legal responsibility" to ensure their territorial waters were "appropriately policed" to allow legal fishing to continue, he added. Prime Minister Theresa May called for an "amicable solution" to the row. "It's what we want and it's what France wants and we will be working on that," she said. Mr Park rejected suggestions that British boats were overfishing the area. They catch just 6% of the scallops in the area, he said, so "if there's any accusation of over fishing it's not on the UK fishermen, it's on the French fishermen." "Scallops are plentiful and they're expensive," he said. "We're doing nothing wrong and what we can't do is be bullied." 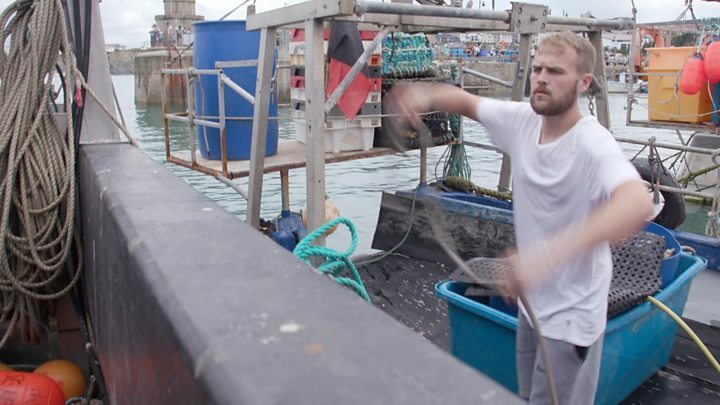 Sheryll Murray, MP for South East Cornwall, said environment secretary Michael Gove has assured her "appropriate measures" are in place to enable UK fishermen to keep working. Local French officials said they could not intervene directly because the conflict took place in international waters. How is it being reported in France? French media have framed the scallop showdown as a "battle" between two nations, with some outlets highlighting the future impact of Brexit. Under the headline "The battle for Saint-Jacques scallops off Normandy", left-wing daily Le Monde cited fishing chief Dimitri Rogoff who said that the UK would normally "be considered a third country and will not have access to these [fishing] zones" after it leaves the European Union. French fishermen are nevertheless worried by Brexit "as Britain plans to pursue its own fishing policy starting from the end of March 2019, particularly regarding access to its territorial waters of boats from EU countries" noted weekly magazine L'Usine Nouvelle. Popular regional newspaper Ouest-France said that sailors from Normandy "insist that they respect the [fish] resources" and had gone to sea "to explain this to the English". "We have won a battle, but we haven't won the war," concluded one French fisherman in a report by public TV channel France 3.